The Range series can display 2D or 3D shapes defined by the begin / end values of their bounding boxes. 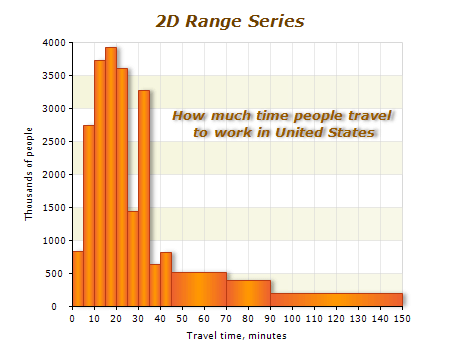 It can be used to display histograms, bars with custom sizes, 3D ranges etc. The Range Series lets you easily define 2D data points by four values, forming two ranges: [Begin X - End X], [Begin Y - End Y]. The following example shows histogram with varying x sizes, used to merge intervals with too scarce occurrences. Range Series lets you easily define 3D data points by six values, forming three ranges: [Begin X - End X], [Begin Y - End Y], [Begin Z - End Z]. In this example Range Series are used to visualize device price and market penetration for CD and DVD players over a period of several years.